Whether it is due to a leaky foundation, or just a faulty hot water tank, CCS has the expertise to rectify your problem. Water damage should be attended to A.S.A.P. The longer water is allowed to sit stagnant in a carpet, the greater the opportunity for mold and mildew to set in along walls and baseboards. If left untreated unpleasant odors will arise within just a few days in carpet and under pad. 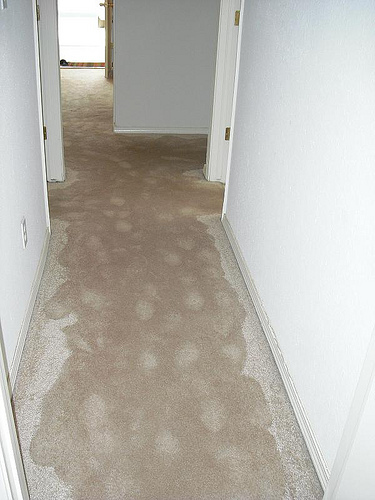 Once the water is extracted from the carpet it is recommended that the carpet be treated with a residual anti-microbial disinfectant deodorizer to ensure the retarding of mold and mildew. When carpet is installed over under pad it may be necessary to lift the carpet and remove damaged pad. Dehumidifiers and flood fans may need to be utilized in order to dry carpet and room A.S.A.P. We have the expertise to supply, install new pad, reinstall carpet, clean and treat the carpet. For the best in Flood Clean-up call 905-819-0462 today!